Princess Diana: Princess Diana Death: They Lied When They Said That Her Injuries Were Fatal! Princess Diana Death: They Lied When They Said That Her Injuries Were Fatal! Princess Diana: Did She Really Have To Die? The injury that killed Princess Diana although critical was not fatal and in fact former President Ronald Reagan survived a similar injury when he was shot by John Hinckley in 1981! Surely if a 70 year old man could have survived such an injury why not a 36 year old woman in good health? The French doctors who were part of the team that tried to resuscitate Princess Diana at the hospital following the crash cited a tear in the left pulmonary vein as the source of internal bleeding that ultimately led to her death...there was no mention of other specific lesions! 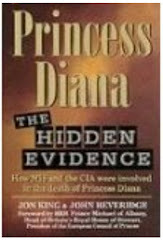 Their conclusion was in stark contrast to the remarks made by the French Minister of Health and other officials (and widely embraced by the public, the media, and disseminated by the official report) that Princess Diana died as a result of massive multiple internal injuries that left her no chance to survive! If Princess Diana Had Been Taken To A Hospital Within An Hour After Crash She'd Probably Be Alive Today! The simple truth is, it is very highly likely that if Princess Diana had been rushed to a hospital immediately instead of being snail-paced for two hours in an ambulance she will still be alive today! Several eminent doctors from around the globe (including French physicians) agreed that a timely evacuation to the hospital would have probably saved the Princess! This tends to corroborate my theory postulating the real reason why the ambulance journey took so long; the plotters were waiting for Princess Diana to bleed out before presenting her to other personnel not privy or involved in the plot (waiting hospital staff). Princess Diana's Condition When The First Emergency Vehicles Arrived! The first witnesses to the crash site discovered Princess Diana seated on the floor of the car with her legs on the backseat and her head sandwiched between the backs of the two front seats. Her eyes were open and she was speaking indistinctly (bodyguard Trevor Rhys Jones supposedly heard her call out Dodi Fayed's name) which established Diana as being conscious at this point. The first emergency vehicle arrived seven minutes after the crash (Sapeurs-Pompiers, a military emergency service) and the SAMU ambulance that took her to the hospital arrived eight minutes later. The physician from the SAMU ambulance said that Princess Diana was agitated and crying and repeatedly mover her left arm and right leg (once again establishing that Princess Diana was indeed still conscious at this point). Apparently Princess Diana then went into cardiac arrest while being extracted form the wreckage so she was intubated, put on a respirator and given external chest massage to reestablish a heart rhythm. The crash caused Princess Diana's pulmonary vein to tear; this type of injury is commonly categorized as a deceleration injury because as the name implies it occurs when a person in motion is subjected to the massive traumatic force caused by sudden excessive deceleration. The Mercedes Benz S280 ramming into the pillar at 60 miles an hour definitely fits into this category. The pulmonary vein transports oxygen-rich blood from the lungs to the heart where it is then pumped to the rest of the body. The pulmonary vein is a large vessel that transports a significant amount of blood. A rip or injury to this vessel will result in internal bleeding in the chest that can quite easily become rapidly fatal; however if the tear is minimal then there's a good chance that bleeding would be minimal and that expeditious repair of the tear would save the patient. The fact that Princess Diana arrived at the hospital almost 2 hours later alive is evidence that the tear to her pulmonary vessel must have been a small tear that exuded blood at a slow rate. (Now you can see why it was so important for the ambulance to take its time getting to the hospital. If the tear had been bigger chances are they'd have gotten Diana to the hospital that much sooner. The outcome would have been the same though, because the assassins would have still ensured that by the time she was handed over to the Trauma Staff at the hospital she'd have been beyond resuscitation...which also explains the final 10 minute stop just outside the hospital gates). As pre-eminent cardiologist Dr. John Ochsner (Chairman Emeritus of surgery at the Alton Ochsner clinic in New Orleans) put it: "depending on the size of the rent, or tear. If it wasn’t too big, they could put the patient on a heart lung machine and just go in and do the repair electively. It’s pretty obvious: with that lesion, if you can get them in hospital and on a heart lung machine early enough you can save them. But time is of essence." He is just one of a very long list of several physicians who believe that expeditious transport of Princess Diana to a hospital operating room could well have saved her! Read the views of other physicians here. It is tempting to conclude that the French emergency evacuation procedures are ironically to blame for Princess Diana's untimely death thereby relegating the entire incident as a mishandled tragic accident. But when one also considers the superb "bungling" of the investigation, disappearance of witnesses, the climbing body count, plethora of lies circulated and other suspicious events, that 2 hour hospital ride is really just a tad too convenient to have been anything but part of the assassination plot! I disagree. Even though mistakes were made in Dian's death, they did what they could.Dodi and Henri Paul were killed immediately. And the only reason Trevor Reese Jones lived is because he buckled his seat belt when the chase began. Kevin Noa Author- Two Princesses: The TRiumphs and Trials of Grace Kelly and Diana Spencer. Could some one please help me. These blessings from God are appreciated by all who receive them and they support various charities. While I appreciate your passion and sadness for her passing, I think that there is much more that can be accomplished in this world by focusing on her accomplishments, rather than speculating upon what we can never know. Even if some of what you suggest is true, people far more powerful than us are behind it and we'll never get the answers to the questions you ask. I blogged on the lessons learned from this tragedy this morning. From your post, and so many others, it is easy to see why she is called the Queen of Hearts. She still touches our hearts ten years after her death. part, so that I can of course become & believe in & so on, greetings, 'J.A.,' guitartie@yahoo.ie, there to be continued, 00562 548 29 31.
influence on business To Get Your Ex Back And. Discover the difference between real and counterfeit love. Why Kill Andanson Three Years After The Crash?